3. Hunt Like Goldilocks: Choose the "just right" options for your style, space, and spending. Goldilocks and the 3 Ss. Shopping for me is always like hunting. I'm constantly on a hunt for Goldilocks "just right" items, things that speak to my Style, are a good Size, and are just right for what I am looking to Spend. When Goldilocks tests the porridge in the story, she remarks that one bowl is too hot, one too cold, but one is just right. I look at style similarly. Some styles are "too hot" for me or for the room I'm working on. It may perhaps be too loud, too vibrant, or too dominant. Other things are too cold: too muted, too plain, or too common place. When I am hunting for style, I'm looking for something that stimulates my senses without overwhelming or underwhelming me, which is a different measure for everyone and for every space. 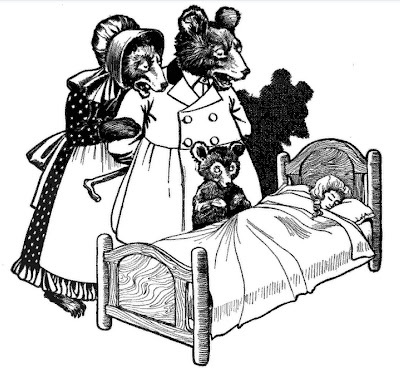 When Goldilocks looks for a suitable bed to rest on, she remarks the comfort of the bed as either too hard, too soft, or just right. When I think of comfort, I often think of space. I personally like for things to feel somewhat spacious, but at the same time cozy. Our apartment is perfect for my sensibilities because it has an open living area, which makes it feel spacious, but each space is condensed, which I love! In our bathroom particularly, finding items that were the right size was a key issue, so measuring the space an item would take up and how much space we wanted comfortably between items was critical for us to note as we shopped. In the middle of the story, Goldilocks seeks a stool to sit on. One of course, is too high for her. One is too wide, and one is just right. This reminds me of spending, really, and I love how no stool is too low for her in the story. What price is too low? (None for me!) Definitely, some prices are outside of my reach and are too high. Some prices are too wide. Even though I could afford an item on a payment plan, it would take longer to pay for than I want or need. And then, there are prices that are just right. Typically, I aim for the middle, like Goldilocks, but not for everything. For some things, I'm like papa bear, like those splurge items: Large, dominant, pricey. For other things, I'm like mama bear: Average, ordinary, inexpensive. Still, for most things, I'm looking for a perfect fit, the happy median, and that's often the price range I shop in, too: median store prices. When I went shopping, I kept a list of what we needed including the measurements for the space each item could take up at maximum. I did not bring a tape measure with me, but in hindsight, that might be better than relying on the measurements on the boxes. 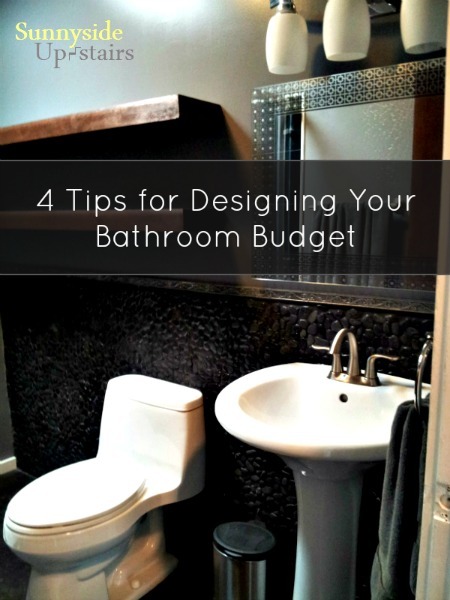 We also chose to purchase things we could see and feel in the store, so we relied on The Home Depot and Lowes for nearly all the bathroom items. It was our first time gutting and remodeling anything and we wanted to purchase things from places that offered online reviews and in-store returns. I stapled, by week, all the receipts for June and July purchases and tracked every item, even the littlest coupling, in an Excel document. This was crazy and time consuming, but in my defense, we had a $10,000 maximum loan to work with for all the new materials in our apartment (kitchen, bathroom, bedrooms) and I wanted to monitor where every dollar was going. For items that I did not initially consider "permanent investments," such as things around or under $100 that are easy to switch up, I considered the just right style, size, and amount I'd need to spend for each. Goldilocks Size - The measurement of the mirror was perfect between our vanity bar light and pebble wall. Perfect, that is, if I turned the mirror sideways. I knew how large the mirror had to be to optimally fit, and how much space I wanted to give around the mirror. I wasn't even looking for a mirror when I bought this one, since I was set on repurposing the apartment's old medicine cabinet tri-fold mirrors (for free), but they just weren't the right size. Goldilocks Spending - On top of the above two points, when I spotted this mirror walking up and down the aisles of Home Depot, it was on sale for $51. It was the cheapest mirror on display for its size, and it was my favorite of all the ones I saw. It was an amazing find for me, relative to our needs and wants. It just so happened this fit the bill in all the "just right" ways. Goldilocks Style - This pedestal sink was my favorite on display. It has a simple, classic look, but was curvaceous without being ornate. Goldilocks Size - It has a considerably smaller footprint than the particle board vanity cabinet we replaced due to unfortunate swelling. However, the actual sink basin itself is deeper and wider on this pedestal sink than on our larger vanity. Imagine that! Goldilocks Spending - Again, I was instantly surprised to find this was the cheapest bathroom sink option on display at our local Home Depot. While other pedestal sinks were $200 or above, the basin and the pedestal of this bathroom sink was about $100. It was my favorite of all the ones on display, and was the cheapest, again! I guess my taste is not in line with the market, as this is now discontinued just a year later, but I love this pedestal sink and I'm so glad we found it during our hunt! Goldilocks Style - My husband and I love the classy, modern look of this vanity light from allen + roth that we saw on display at Lowes. 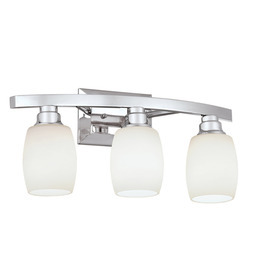 Goldilocks Size - The three lights are the right size for our small bathroom, and spans our mirror and sink appropriately. Goldilocks Spending - My husband and I purchased this light from our local Lowes the same time we purchased our hallway light, stairwell light, and master bedroom ceiling fan. I kept all my original purchase receipts from a year ago, and at the time, I paid $76 (without HI sales tax) for this light. So by this point, our budget includes a $700 shower, a $300 toilet, a $400 pebble accent wall, a $50 mirror, a $100 sink, and an $80 vanity light for a running total of at least $1,630. =D A few years ago, I saw a photo of another teacher's poster about choosing "Just Right" books and thought of Goldilocks. I mention it to students when they are trying to choose a book that is not too hard or too easy for them. Since then, I've approached our shopping as if I were Goldilocks. :) I'm so glad you found this helpful! bahaha! This had me cracking up! Such a fun way to go through the process :) But really, sometimes the hunt is exactly like that! Your bathroom is looking amazeballs. I can't wait to see the rest of it come together.